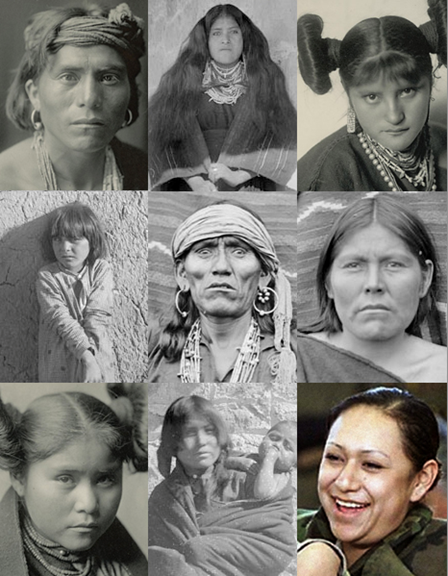 The Hopi are a Native American people who live in Arizona, USA. Benjamin Lee Whorf (1897-1941) was a linguist who researched Hopi, and published a grammar of the Hopi language. Verbs in the Hopi language are noteworthy for their very rich and expressive development of verbal aspects and voices. I shall say nothing in this paper of the nine voices (intransitive, transitive, reflexive, passive, semipassive, resultative, extended passive, possessive, and cessative); and of the nine aspects (punctual, durative, segmentative, punctual-segmentative, inceptive, progressional, spatial, projective, and continuative). I shall deal with only two. … Hopi also has three tenses: factual or present-past, future, and generalized or usitative. Hopi verbs belong to seven classes or conjugations having slightly different inflectional systems. Class 1, the largest and most creative class, contains a few categories not found in the other classes, among them the segmentative aspect. The simplex of the class-1 verb is a bare root … , and is in the third person singular intransitive voice, punctual aspect, and present-past tense. The segmentative aspect is formed by final reduplication of this root plus the durative suffix -ta, and produces a change in the meaning of the simplex of the following character: the phenomenon denoted by the root, shown in the punctual aspect as manifested about a point, becomes manifested as a series of repeated interconnected segments of one large phenomenon of a stretched-out segmental character, its extension usually being predominantly in one dimension, indifferently of space or time or both. The nature of the change can best be shown by examples. In these and similar examples, the phenomenon is such that it requires a rigid or semirigid substance for its field of manifestation. When this is the case the punctual intransitive has somewhat the character of a passive, and the segmentative shows the phenomenon multiplied along one dimension of space, like a candle flame between mirrors. In both aspects, the phenomenon shows up as an effect established and thereafter retained in the rigid substance, so that we are presented with a static tableau of this effect as it is disposed in space. All this has a wider interest than the mere illustration of an aspect-form. It is an illustration of how language produces an organization of experience. We are inclined to think of language simply as a technique of expression, and not to realize that language first of all is a classification and arrangement of the stream of sensory experience which results in a certain world-order, a certain segment of the world that is easily expressible by the type of symbolic means that language employs. In other words, language does in a cruder but also in a broader and more versatile way the same thing that science does. We have just seen how the Hopi language maps out a certain terrain of what might be termed … physics. We have observed how, with very thorough consistency and not a little true scientific precision, all sorts of vibratile phenomena in nature are classified by being referred to various elementary types of deformation process. The analysis of a certain field of nature which results is freely extensible, and all-in-all so harmonious with actual physics that such extension could be made with great appropriateness to a multiplicity of phenomena belonging entirely to the modern scientific and technical world—movements of machinery and mechanism, wave processes and vibrations, electrical and chemical phenomena—things that the Hopi have never known or imagined, and for which we ourselves lack definite names. The Hopi actually have a language better equipped to deal with such vibratile phenomena than is our latest scientific terminology. This is simply because their language establishes a general contrast between two types of experience, which contrast corresponds to a contrast that, as our science has discovered, is all-pervading and fundamental in nature. According to the conceptions of modern physics, the contrast of particle and field of vibrations is more fundamental in the world of nature than such contrasts as space and time, or past, present, and future, which are the sort of contrasts that our own language imposes upon us.